Samantha For The Defense. 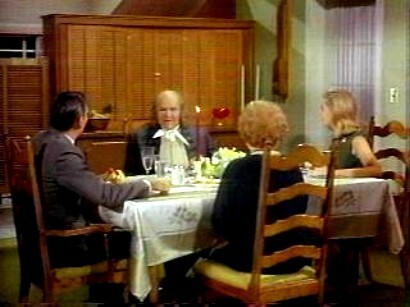 Aunt Clara pulls one of her goofs and accidently brings Benjamin Franklin into the 20th century - scene from Samantha For The Defense.. Wallpaper and background images in the Bewitched club tagged: bewitched elizabeth montgomery samantha for the defense episode photo. This Bewitched photo contains restaurant, eating house, eating place, eatery, brasserie, and bistro. There might also be dining room, dining room, parlor, parlour, drawing room, and withdrawing room.